the Braun Bunch: OK. A Real Post. It's November 28th and I have completely failed at this NaBloPoMo. My life just isn't exciting enough to do this every day for a whole month. I can't wait for December 1st. Then I will continue to blog, but not every day. Hopefully then, I will be able to write something a little more interesting and read-worthy. That's not the only reason I am looking December 1st. Paco is building me a table for my Christmas Village and I am hoping he will be done by next weekend. We are going to decorate the house next weekend including the tree and hopefully, the village. I love Christmas. this year we are doing something different for Christmas. Me and my kids, and David and Carolyn with their kids are going to Ucluelet for December 24, 25 and 26. We are going to be staying here. This is the Terrace Beach Resort. For any of you that are interested, it is owned by Jason Priestly and his parents. They all come with a private hot tub and baebeque. 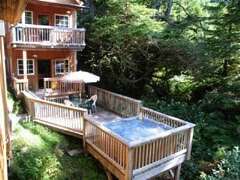 They have an ocean view and trasils to wlak on and it is going to be completely different from our usual Christmas of too many gifts and not enough family togetherness. I am excited to be there. Also in December is our family gathering. Since Mom won't be here for Christmas, we are having our gathering on the last Sunday before she leaves, which is on the 13th. it's a little earlier than we usually do it, but it is important to all of us that we do it with Mom here. So I am really looking forward to December 13th. Now, both of the following will be interesting blogging. Telling you what I did yesterday or am going to do today would bore you all silly, since it consists of a lot of sitting, watching TV, making meals, going to therapy, and cleaning house. Although, yesterday, I had friends come over for dinner and the evening. I made homemade tomato noodle soup, and we played a four hour game of Settlers of Catan. that was fun. I should have taken a picture of our huge board to show you, but I didn't so you'll have to take my word for it. OK. that is it. I have nothing more for you today. I will try to do something tomorrow, but don't hold your breath. Both of the following? I meant to say, "Both of the previous". What a schmuck. Trav. you need to post a little more often without any spelling mistakes before you can make fun of me. :) Carrie, I just want to say that you practiced good self control until you let Travis lead you astray. In other news. I may murder my neighbor's dog ANY MINUTE now. Question for you...Why are you not playing Carrie's Balderdash blog game??? Com'om I am the only oldie on there. I forgot about balderdash!!! Oh Noooo. I hope you have a lot of fun this Christmas! I can hardly wait to see pictures of all the trasils that you wlaked on!! Those should be good.